Flex driving school is based in Plaistow and it provides driving lessons throughout Newham and the surrounding area. According to their website, all their driving instructors are fully qualified and regularly assessed, to ensure a high standard of training. If you would like to pay for your driving lessons online with Flex Driving School, you can do so using Paypal. You can also use Paypal to purchase gift vouchers for someone you know. It is worth noting that the vouchers can not be redeemed for cash. The majority of the schools’ reviews can be found on Google and the company has two review profiles. The first has has a 4.9 out of 5 rating based on 53 reviews. While the second profile has a 5.0 star rating based on 2 reviews. You can also find Flex Driving School reviews on Pinterest, complete with pictures of students who they have helped pass their driving test. Based on comments left by their previous students, Mashud Bai is one of their best driving instructors. His patience and clear and concise teaching methods, were mentioned on several occasions and he would be a good instructor to start out with. If you are looking for reviews hosted on the flex website, they are located on this page. Pictures of students who have recently passed with the driving school can be found in their gallery. On the Flex Driving School YouTube channel, there is a video highlighting some of the reasons why you should choose the driving school. The video is embedded below. Flex do not offer automatic driving lessons and prices for manual lessons differ based on the time of day you are booking. Booking on a weekday before 5pm will save you money, compared to booking a driving lesson with them in the evening or a weekend. If you are getting in touch directly with Flex, you can use the contact details above, or their call me back service, which can be found here. 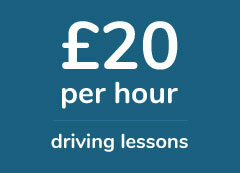 Flex are one of the best driving schools in East London. My driving instructor was very patient. I'm a slow learner, it takes ages for me get things but my instructor didn't rush. I was ready to book my test after 45 lessons. I passed with only 6 minors,. Yes SIX! Really happy with Flex. Thanks alot! I really struggled with dual carriageways and I came to Flex for help. I already had lessons in the past but my previous instructor was not great. Flex were really good to me and I only needed a few lessons, to master the carriageway. Highly recommend if you are looking for a good instructor in East London. Booked driving lessons with Flex and I have no complaints. Passed at the second attempt. My instructor was good and he kept the lessons interesting. Learnt with Flex on an intensive driving course. It was a bit expensive, but it made me pass, so it's fine. Definitely give them a ring if you need your license quickly.